Sales coaching is a process which is now applied in various sales intensive businesses. This is a useful process in any organization because it is known as a series of activities and conversations that offer ongoing encouragement and feedback to sales people and any other member of a sales team with an aim of improving their performance. The entire sales coaching process works in providing an effective collaboration which helps in resolving issues in the sales department and developing a solution which is more efficient in setting up a much better learning experience. Sales coaching also involves the setting of expectations in the sales department, coaching disciplines that are useful in the effective selling of products and services, getting feedback about your ability in selling and skills improvement. If you want to work as an expert in sales coaching, then it is best for you to look for a sales coaching certification program which can work suitably for your needs. Enrolling in this program will let you become more familiar about the few skills that you need to hone in order for you to become an effective and successful sales coach. Receiving your sales coaching certification will let you know that a reliable and effective sales coach is someone who is capable of providing good feedbacks, practices, questions and observations that do not push a member of a sales team towards a specific end but ensures that he is able to develop objectives for the betterment of the entire sales team which he is a part of and for the improvement of his skills. As the leading online certification and testing company at present, Brainmeasures is capable of providing you with a reliable sales coaching certification program if you are one of those who have longed to become a sales coaching expert. The program provided by Brainmeasures to aspiring sales coaching experts are developed with the help of the expert hands of professionals so expect to be able to receive a stronger grasp about the field after taking it up. 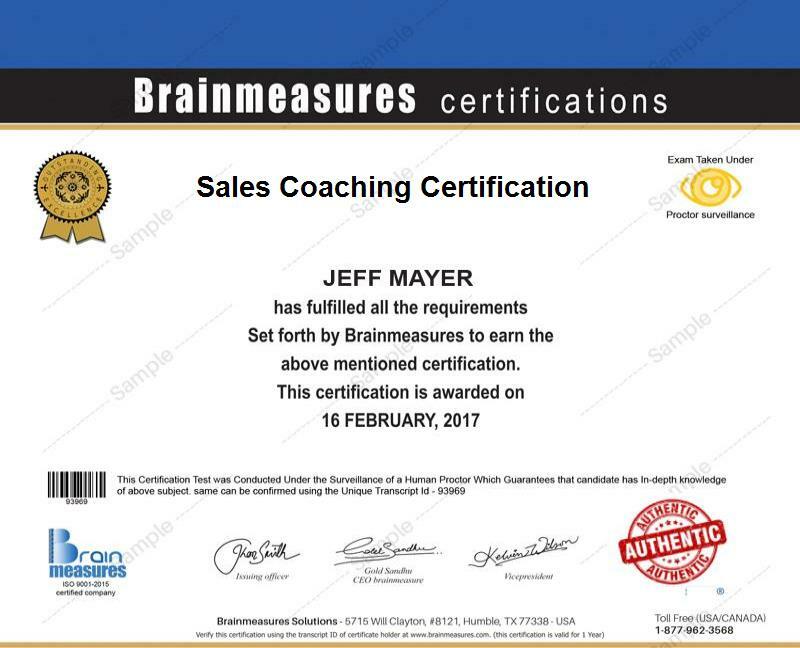 If you wish to take up the sales coaching course from Brainmeasures, then you should become aware of the fact that you won’t be able to hold your certificate unless you pass the sales coaching exam which is a part of the program. You will never regret becoming a part of the sales coaching certification program offered by Brainmeasures since aside from honing your skills in coaching a sales team, you will also be able to handle sales management more effectively. Enrolling in the program will also transform you into an effective sales coach because this molds you into a skilled facilitator, questioner and observer who is capable of establishing independence, measurable business results and purposeful conversation within the sales department. The sales coaching certification program which is offered in Brainmeasures is a huge help for individuals who wish to mentor a team composed of members who are tasked to sell the products and services of an organization. This certification course is also ideal for you if you want to learn more about the sales management process. You can expect to receive a higher annual salary as soon as your sales coaching certification is already within your hands. Expect to earn around $31,000 to $109,000 annually after becoming certified as a sales coaching expert.